This yellow rose was a gift from my brother. We planted it between our driveways with our neighbor (the preacher with the green thumb and grand azalea bushes out front). It was our only sense of pride as it was the only thing that bloomed in my yard for years. Growing this rose was really easy. It was in a well drained area. Got full sun. Had the heat of pavement on 2 sides, which I think helped with any pests. We only watered it on occasion because all normal rain ran into the flower bed. Then it got run over by a boat! Yea, backing in my 27 foot cabin cruiser, well, lets say I needed bigger mirrors at the time. Shucks, I gotta admit. I couldn't back that thing in without 5 spotters and somebody else at the wheel! I even took out the basketball goal, and a small apple tree with that boat! Ask my kids, they were hoopin and hollerin at me to cut it, cut it! I cut it! the wrong way. Seems you gotta steer opposite the way you want to go with a trailer. Oh well. I still got a good painting outta this. 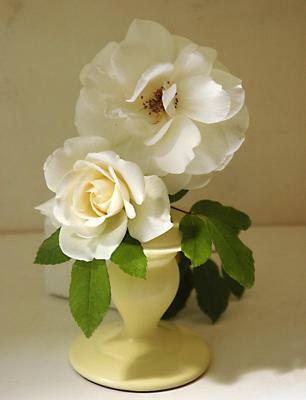 Well, actually not a single white rose, but two white rose blossoms in a single vase! This reference photo was gleened from an art forum that features a great section on reference photo's. I'll have to do some digging to find it for you. I may already mention it somewhere here on the site, but my site has gotten unruly and I'm needing to add a google search button on it. But in the mean time, please enjoy this one picture. It is a great composition and the whites make it easy to paint. Being white, it will go with most home decor! If you want to add a little splash of color, change the vase or background color to suit your needs. Until next time... happy painting! If - cancel that - WHEN you pain this, LET ME KNOW! I SOOOOOOoo need this painting! Or at least a print or photo! My good friend Debbie let us have a few of her old style roses. She's our florist. Her shop is called Angelic Haven and she's located on Timberlake Road should you ever be here for a visit! She is what you call a true entrepreneur. This shop she is in was a beat up, run down, rat trap that has now been transformed into this gorgeous little cottage of colors and smells that make my head spin when I come in sometimes. Right on the main drag, she and her husband worked their hands raw getting this place in shape. So much so, that a new tenant is now renting the shop next door (duplex) because it looks so good when you drive by! Any way, these roses have that antique look to them, so I took afew home and began shooting. This is one of the close ups that I think will make for a great 30 x 40 canvas! So here I am, painting again after 30 years and cruising the internet and see this beautiful rose. 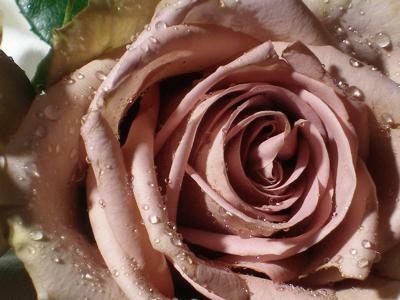 I live in Madison Heights and will be using your purple rose to see how well I can do at painting it. If it turns out well, I'll drop in and show it to you. We appreciate friends like u guys!! 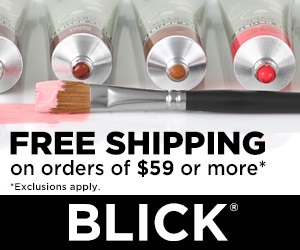 Thank you for the mention of the shop! The rose picture is awesome! I have never seen a purple rose before and am in awe over this one. What a pretty rose. 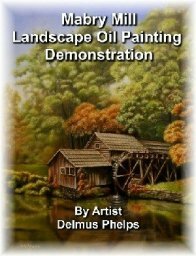 Thank you for sharing it with us on easy oil painting. Rose of Sharon, Pretty in White, althea. I love the center color of this white flower. Taken at the Wellfleet Audubon, Cape Cod, Ma. Hi Yvette, yes, they are beautiful. 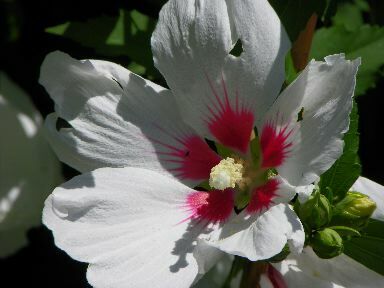 This is a variety of "althaea" (althea) as Hibiscus syriacus. 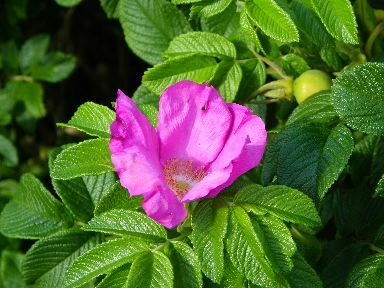 Its common name is Rose of Sharon. My neighbor gave us a cutting years ago and I've used it for painting ever since. I do need to get one of the white varieties (like this) as they are so nice. 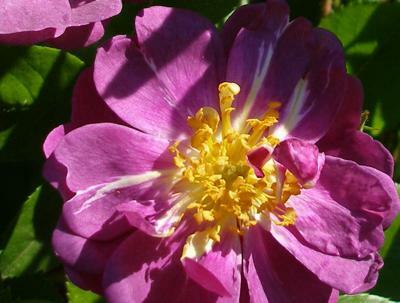 Here's an antique rose that was found at our local military cemetery. There are a number of antique roses within this old confederate/city cemetery that are tenderly cared for by a local society. Each year, we have a celebration and gather around this wonderful garden to take in the wonderful smells, bright sun shine and extraordinary blooms. I've tried to grow a few, and sometimes I'm lucky, but mostly I flop. Maybe this year will be my year to get some to really take root! Enjoy. It's a very close up with a striking color combination. I'm presently painting this one and have it in one of the forums. Once completed, I'll include it as a demo on the site. Sea Roses are very fragile and grow wild by our beaches on Cape Cod. Usually find them along a marsh or inlet near water. They grow in pink, red and white. 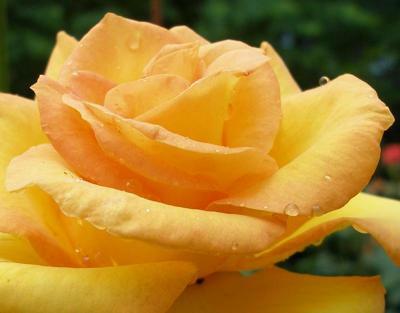 The distinguishing feature of this rose, in my opinion, are the serrations within the leaves. So pronounced and uniform. Almost like a mint that grows wild here. 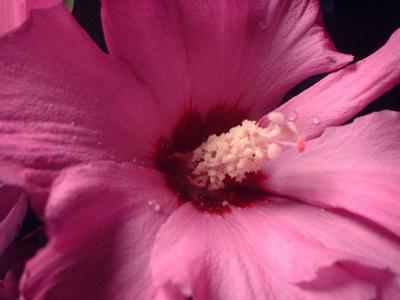 This is a single blossom from our Rose of Sharon bush. It was given as a small cutting years ago, and the bush has been transplanted several times and continues to thrive. I don't profess to have a green thumb so its got to be the bush. They simply are tough as nails. Because of it's height, we put it near the back of the planting bed where it frames the view nicely. I guess it can get over 6 feet tall, but I trim it pretty regular to keep it in check. No bugs either. And seems to be fairly drought proof. Then again, my planting bed is mostly composted leaves and loamy soil, so it retains its water well. I've added a few dew drops to this, as you know, I love dew drops in my paintings. They are the bling that brings the eye in for a closer look and makes things look so real! I have a whole lesson on how to make these on the "More Lessons" tab of the nav bar. Hey, how do you like the new look for the site? It has a cleaner, simpler look and feel I think. The white background is helping show off all the photos so much better. And the nav bar is so much easier to read. This was one of my last autumn roses before a killing frost. Took the picture while dew was still present. Hopefully, I can add more rose pictures when I get a bit more time. 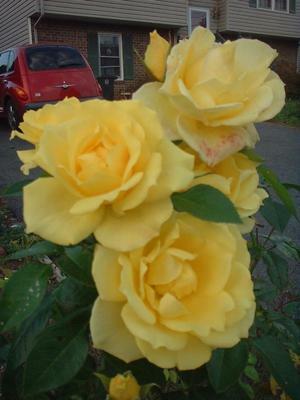 This has been one of my favorite pastimes in growing these hybrid tea roses. I've also got an old antique rose, a white one that has held up well this last year. We had a bit of a drought here in Virginia and between that and the bugs and beetles, I didn't get much of a crop! Anyway, I hope you enjoy this, it was the subject of a painting the is posted here on the site. Go ahead, and have a go! Click on the read comments to see how this photo turned out in a painting!